Perforated eardrum can occur as a result of pressure changes (barotrauma), mechanical trauma, infection or noise trauma. The animation of myringoplasty (or type 1 tympanoplasty) operation is showed on the video above. You can find details about traumatic eardrum rupture treatment, myringoplasty and tympanoplasty operations on the below. Hole in the eardrum can occur as a result of infection or trauma. Depending on the eardrum hole recurrent middle ear infections and hearing loss may occur over time. A surface area of the eardrum vibrates with sound waves. The larger hole in the ear membrane cause to less vibrate with less transmission of sound energy. According to the location and size of the perforation conductive hearing loss emerges. In addition, recurrent infections of the middle ear can cause negative effects on middle ear bones and on the auditory nerve. Above 4 days traumatic eardrum perforation the result of previous trauma4 days ago. Bleeding areas can be seen on perforation edges. Hole in the eardrum with purulent ear discharge longer than 6-12 weeks is called as "Chronic Suppurative Otitis Media". This disease can be seen with or without cholesteatoma (Cholesteatoma definition: Cholesteatoma is a destructive and expanding growth consisting of keratinizing squamous epithelium in the middle ear with / without mastoid bone. The migration of squamous epithelium of external ear through a tympanic membrane perforation into the middle ear forms a cholesteatoma (references: Cholesteatoma / Extensive tympanic membrane cholesteatoma with marginal perforation: an unusual case). In the photo above the large central eardrum perforation, purulent discharge and circular tympanosclerosis are seen. Patients with a hole in the eardrum, they need to be very careful when entering the pool and swimming. With the small amount of water contact may cause serious middle ear infections in patient with perforated ear drum. It is seen in the photo above and the tympanic membrane perforation with retraction pockets. The appearance of the tympanic membrane is not natural and it is seen that middle ear filled with granulation tissue. Temporal bone tomography revealed that mastoid bone cholesteatoma. Tympanoplasty + mastoidectomy operation planned for this patient . 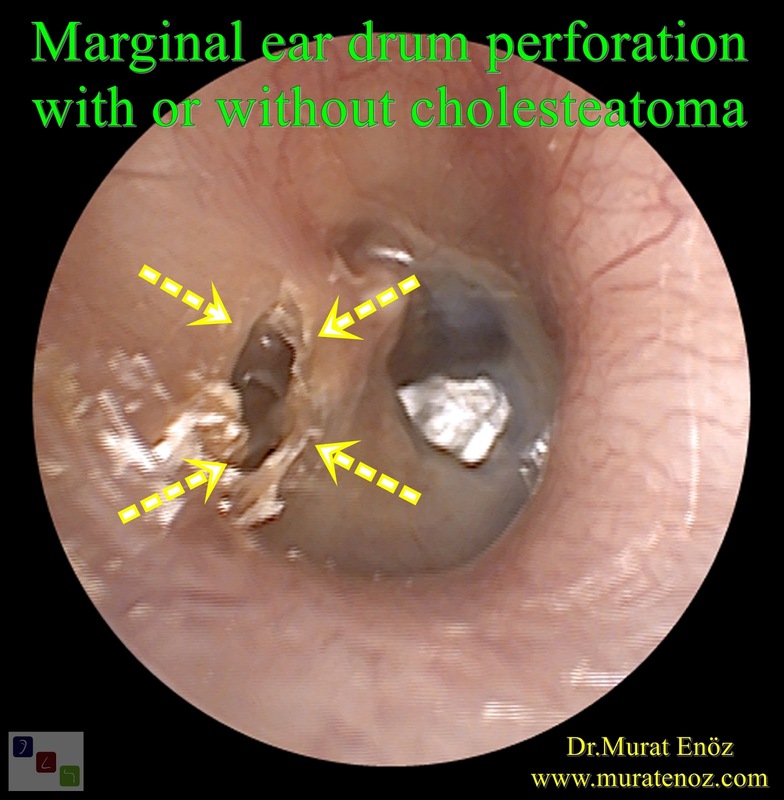 Marginal eardrum perforation and retraction pocket are seen on the photo above. Sometimes these types of perforations can accompany Cholesteatoma. A central perforation is a relative contraindication for scubadiving and a marginal ear drum perforation is an absolute contraindication for scubadiving (reference: [Middle and inner ear barotrauma caused by scubadiving (author's transl)]). Sometimes recurrent middle ear infections can cause to damage on ossicles (small hearing bones). If ossicles are damaged in addition to the eardrum then the hearing loss would be much greater than, a small perforation (reference: Perforated Eardrum. 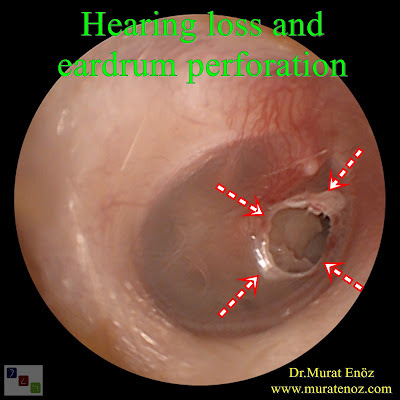 Symptoms of perforated eardrum). Holes in the eardrum and partial loss of ossicles highlights are seen on the photo above. Sclerosis of ossicles also exist with tympanosclerosis. Patient defined severe hearing loss although small perforation size. Sometimes a small hole in the eardrum may not be noticed as a result very few symptoms. Only after contact with water ear discharge and hearing loss. Hearing loss is a very small amount. Tympanic membrane perforation and is seen small circular tympanosclerosis in the photo above. Even a small hole; it is a problem for diving and for swimming. Eardrum can be perforated , after the burst trauma or sound pressure trauma. In these patients, it is important to avoid contact with water from the ear. For treatment of traumatic eardrum perforation, paper, adipose tissue, cartilages, cartilage membranes or fascia grafts may be placed on membrane over the hole. 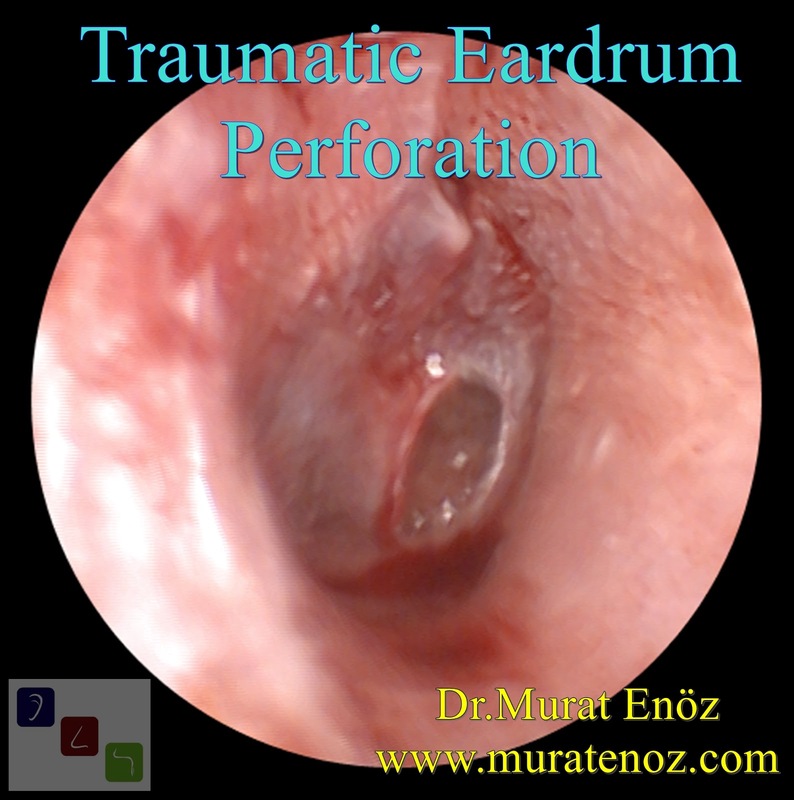 The photo above shows the eardrum and the outer ear bleeding due to traumatic tympanic membrane perforation. In the above photo it is made to the eardrum patch with cigarette paper. Usually the eardrum heals within a few weeks and paper patch automatically fall away. Above myringoplasty surgery animation is shown in a simple way. The aim myringoplasty surgery is repairing the damaged area of the eardrum. In this operation, cartilage membrane (perichondrium), muscle membrane, cartilage can be used as graft. After the local anesthetic injection on outer ear canal near the ear drum, dead cells in the hole in the eardrum edges removed. Sponge placed in the middle ear. on the eardrum (overlay technique) or below (underlay technique) prepared graft is placed. Antibiotic-impregnated spongels are settled on graft and the operation is completed. How long does myringoplasty surgery take? How long time you need to stay after the myringoplasty operation? Myringoplasty operation is a simple surgical intervention. You'll not feel a lot of pain and discomfort, do not worry! After 1 week, please come to control point (private ent office of Dr. Murat Enoz). Usually at the seventh day, sutures are removed and the external ear canal is cleared by us. Sneezing, coughing, pushing air from clogged nose (Valsalva Maneuver) is inconvenient. Mouth should be fully open while sneezing. 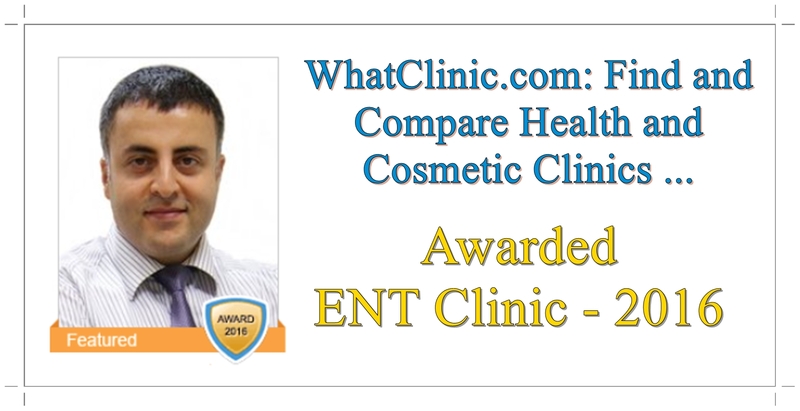 Please contact with me in case of , increasing of ear pain, swelling, purulent discharge, fever. "Tympanoplasty" is defined as "Surgical repair or reconstruction of the middle ear" (reference: Tympanoplasty | definition of tympanoplasty by Medical dictionary). The aim tympanoplasty is repairing the damaged area of the eardrum with / without middle ear ossicles. In this operation also, perichondrium, muscle membrane, cartilage can be used as graft preparing. Tympanoplasty operation is more appropriate for large perforations with / without ossicular damage as seen in the photo above. Type 4 Tympanoplasty: Repair when the stapes foot plate is movable, but the crura are missing. The resulting middle ear will only consist of the Eustachian tube and hypotympanum. Above animation of tympanoplasty operation is shown in a simple way. After the local anesthetic injection on outer ear canal near the ear drum, endaural incision or retroauricular incision is performed. Ear canal retractors (Wullstein-Weitlaner retractor) is placed. Dead cells in the hole in the eardrum edges removed. Rosen incision is performed and tympanomeatal flap is elevated. Sponge placed in the middle ear. Fascia, cartilages or cartilage membrane (perichondrium) is placed on manubrium mallei. tympanomeatal flap turned down to previous natural position. Antibiotic-impregnated sponges are settled on graft, ear buffer in inserted in external ear canal and the operation is completed. tympanoplasty operation is bigger operation than myringoplasty. 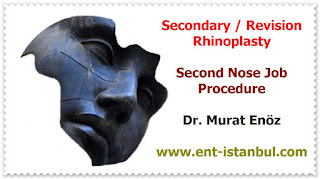 How Can You Contact With Dr. Murat Enöz For Septoplasty Operation in Istanbul? If you want to contact with Dr.Murat Enoz about ear drum surgery my WhatsApp number is 00905336550199 and my email: muratenoz@gmail.com. We can meet with WhatsApp calling when we have the right time.